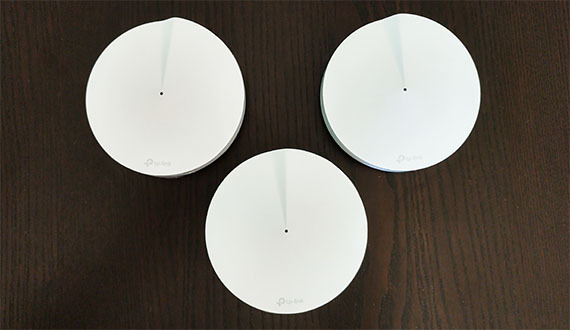 The TP-Link Deco P7 is one of the two latest WiFi mesh systems recently released by TP-Link (besides the Deco M9 Plus) and, at first glance, you may notice that it looks identical to the older M5 and you would be right, there is no design difference between them and we’re still dealing with dual-band units. 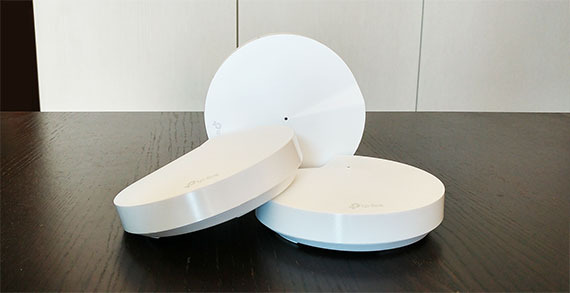 What the Deco P7 brings new to the table is the adoption of the HomePlug AV600 standard which allows the user to interconnect all the Deco units using the home electrical wiring (ideally, on the same circuit) where the WiFi signal won’t reach each node to form a mesh network (the case in older homes or when there’s lots of interferences – you can also read more about how the powerline technology works in this guide). 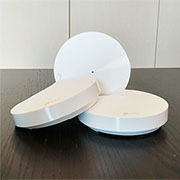 Furthermore, the Deco P7 can use the powerline technology to transmit data between the nodes, so it can work in a similar manner to the Ethernet backhaul feature, ensuring more bandwidth for all the connected clients and avoiding any unnecessary congestion especially when using a multi-hop configuration. 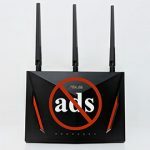 Sure enough, it lacks the smart home abilities of the M9 Plus (although it’s still compatible with IFTTT and Alexa), as well as the additional 5GHz radio band, but it still promises to be a nice upgrade over the Deco M5, so let’s have a look if the powerline tech can make a significant difference and if the other manufacturers should also consider implementing it on their new WiFi systems. Like I said in the introduction, there is no physical difference between the Deco M5 and the Deco P7, both systems sporting small form-factor units, designed to resemble a seashell on the top side and the round case ensures that the units can be easily positioned in most place in your room. 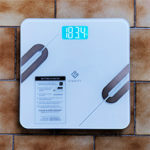 Furthermore, each Deco P7 is covered by a matte white finish with a glossy band surrounding the case and the system is available as either two or three devices (all Deco P7 nodes are identical). Unlike its bigger brother, the M9 Plus, the Deco P7 has kept the same dimensions as the M5, so it also measures 4.7 x 1.3 inches and it kept the same 0.48 lbs in terms of weight. This could make it a bit more susceptible to budging especially when you connect all the ports, but the four silicone feet on the bottom area make sure that it can’t fall off the table. 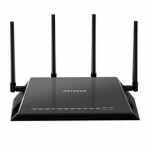 Similarly to most (if not all) other WiFi systems, the new minimalist design is a significant improvement from the industrial-looking routers, but there are some shortcomings: you can’t mount the Deco units on the wall or ceiling and you can’t upgrade the antennas (since they’re internal). 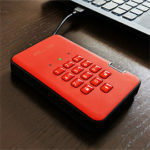 The advantage is that these small devices will blend in with any room style and they won’t take much space from the shelf, table or desk. Sure enough, you can’t always get away with cramming up all the necessary hardware in a small device since it can more easily overheat, but, just like with the Deco M9 Plus and the M5, TP-Link has also added those punctures holes on the bottom area which do help a bit with the heat management (more so than the Google WiFi or Eero which completely lack any type of ventilation cut-outs). But it’s not always about size and it’s sometimes more about chipset efficiency – remember the Asus RT-AC68U which runs hot and the new RT-AC86U which has borrowed the same case and is more powerful, but it runs at a proper temperature. This way, I noticed that the Deco P7 gets a bit warm on the bottom area and there were some hot spots near the label, especially when put under some stress. 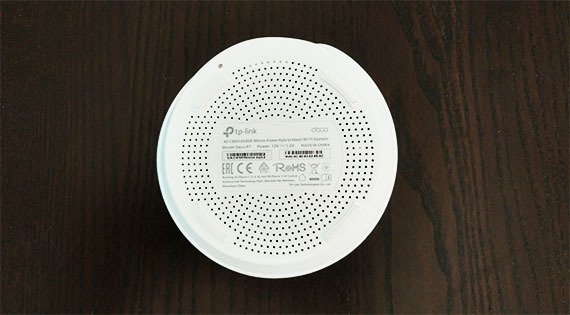 While other manufacturers went for big, flashy LED lights, TP-Link decided that a discrete, small indicator would suffice, so, at the top of the device, you’ll notice a small LED which has the role of showing the status of the network: the LED will be solid yellow when the Deco router starts up and will start flashing blue immediately after it is ready to be set up; after you initiate the initial configuration process, the LED will become solid blue. After the Deco router is registered and everything is working properly, the LED will become solid blue and, as soon as it encounters an error, it will become solid red. 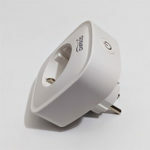 The one LED approach has been the preferred option for almost all WiFi systems because the manufacturers have seen it as the most suitable option to go with the minimalistic nature of their devices. Sure, it looks better than the array of LED lights, but it is extremely unintuitive and the user has to constantly consult the user manual to understand what those colours mean. A simpler system could be based on a voice assistant which could guide the user through the configuration process (and the P7 is compatible with Amazon Alexa). Turn the Deco P7 unit around to expose the ports area: from the left, there’s a USB type-C Power slot which connects to the wall socket using the power adapter provided in the package and next to it, there are two Ethernet Gigabit ports, one for connecting the router to the modem (for Internet access) and the other for connecting any additional clients that require a wired connection. On the bottom of the device, next to the label, you can see a small recessed Reset button which, if pressed, will return the Deco unit to the factory default settings. 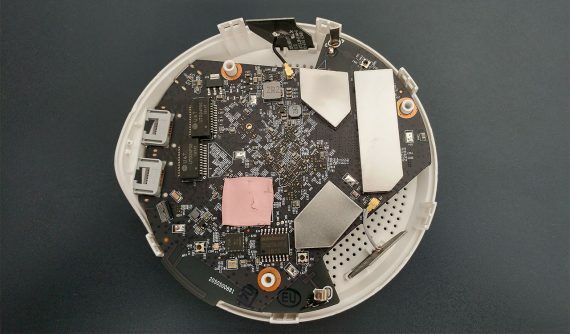 Considering that there aren’t design differences between the TP-Link Deco M5 and the Deco P7, it’s safe to assume that there aren’t significant differences in terms of internal hardware: I have opened the case and indeed, the P7 comes with a quad-core Qualcomm Atheros IPQ4019 chipset, 32MB of flash memory (WINBOND 25Q256JVFQ), 256 MB of RAM and two U&T UTG24P05 1814T 100/1000M Base Single & Dual Port Transformers. Furthermore, the Deco P7 also comes equipped with a CSR 8811 A12U 80GN5N Bluetooth 4.2 chip. Additionally, the maximum theoretical data transfer rate of a single Deco P7 unit is 867 Mbps using the 5GHz radio band and a maximum theoretical data transfer rate of 400 Mbps using the 2.4GHz radio band (adds up to 1267 Mbps which gets rounded by TP-Link to the advertised 1300 Mbps). Similarly to the Deco M5, the Deco P7 takes advantage of TP-Link’s proprietary WiFi mesh technology which is implemented on all the system’s units and has the role of covering a large area with WiFi. This way, you can place the Deco nodes all around the house and they’ll interconnect to make sure that when the client is roaming around the house, it will experience no disconnects. 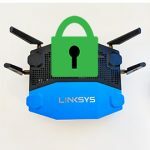 To accomplish this, the proprietary mesh technology scans all the nodes to detect the signal strength, the number of clients connected to each node, the radio bands that are least overcrowded (and more), so it can create optimized paths for the data. Furthermore, in case you add a new Deco node to the network, the system will automatically detect it and create new paths for the data, while in case a node fails, the system will detect the closest and least crowded node available which will take the load, therefore ensuring that the data always reaches its destination safely. It’s worth noting that the Deco app doesn’t allow you to change the channel, disable the WiFi or any other advanced settings that may impede with the functionality of the Deco system (for this reason, I had to connect one of my Android devices multiple times to the router until it put it on the proper band and channel to stop it from compulsively disconnecting from the network). 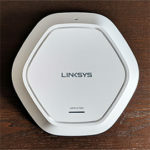 As with all WiFi mesh systems, the main problem that needs to be solved is to keep the backhaul traffic in check so it won’t eat up all the bandwidth (as it usually happens with multi-hop systems). 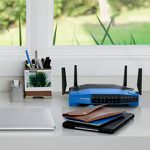 The best way to get the best performance is to use the Ethernet backhaul feature, but, since not many people want to still use cables in their homes when they have a Wi-Fi system, some manufacturers have developed tri-band system, where the extra band is usually used for the backhaul traffic. 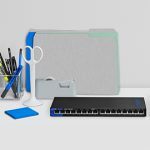 Considering that the Deco P7 is a dual-band system, TP-Link had to get creative so it has implemented the Wi-Fi + PLC Hybrid Mesh technology (similarly to the Arris SBR-AC1900P). 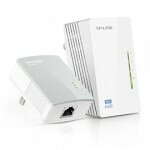 This tech takes advantage of the aforementioned mesh technology, but, if there are too many walls, the house is too old or if there are too many interferences, the Deco P7 uses the powerline technology to ensure that the nodes still get a decent connection and, at the same time, it is also a new way to offer some relief to the network in case the bandwidth gets eaten up by the nodes’ interconnectivity. 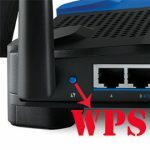 Furthermore, just like the M5 and the M9 Plus, the P7 supports 802.11r Fast Roaming, but this feature is kept disabled by default because it requires compatible WiFi adapters (from the client side) and some older clients may not play nice with the routers (you may experience frequent disconnects).